Michael Vachiraadisorn identified ways that General Motors could reduce the energy intensity of its paint shops. The global automotive company General Motors is committed to reducing the energy intensity of its global operations by 20 percent by 2020. Additionally, the company participates in the Department of Energy’s Better Buildings, Better Plants initiative to achieve a 25 percent reduction in energy use in 31 of its U.S. plants by 2018. GM identified its paint shops, facilities that use a majority of an assembly plant’s energy load to operate, as one opportunity for finding energy savings. 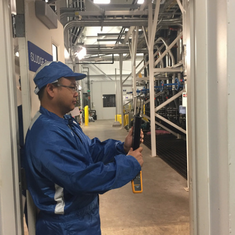 GM enlisted EDF Climate Corps fellow Michael Vachiraadisorn to optimize operations for energy conservation, develop best practices for energy, water and carbon use, and put together guidelines for paint equipment in one of its facilities. Vachiraadisorn familiarized himself with the paint shop’s three modes of operation: production, maintenance and unoccupied. Maintenance mode is designed to be used when the facility has a decrease in occupancy, best suited to be used during non-working hours. However, maintenance mode was not being used due to technical difficulties. Vachiraadisorn realized that by resolving the technical issues and enabling facilities to shut down and enter maintenance mode, GM could save significant amounts of energy. During site visits, Vachiraadisorn also noticed that the space temperature in the paint shop was higher than other facilities in winter, resulting in excess energy use. He recommended that the temperature be regulated to a lower degree. If the paint shop consistently uses maintenance mode during shutdown, GM has the potential to save up to $161,945 a year. By lowering the thermostat setting, the company could save an additional $221,237 annually. In total, Vachiraadisorn’s recommendations could save up to $383,182 annually, putting GM on track to meet its 2020 manufacturing commitments, including reducing energy consumption by 20 percent by 2020. Michael Vachiraadisorn is an MBA candidate at the University of Oregon. Having lived in Bangkok, a city greatly impacted by flooding caused by climate change, he knows the kind of effect natural disasters can have on a regionâ€™s people and economy. He hopes to help push companies to approach their operations in a more sustainable way.